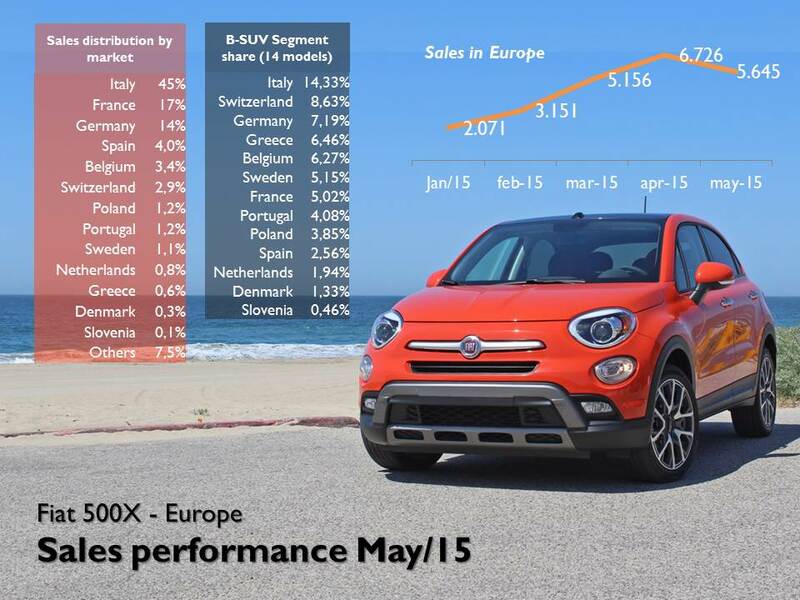 The latest European car sales data indicate that FCA controlled 11,01% of European B-SUV sales during May thanks to the rising demand of its products, the Fiat 500X and the Jeep Renegade. Both cars occupied places #8 and 9 of the ranking composed by 20 different models, which include the new arrivals: Suzuki Vitara, Mazda CX-3 and Ssangyong Tivoli. In May 2015 European B-SUV registrations totaled 95.816 units, up 39% over May 2014 results, whereas total market’s sales advanced 1,4%. France is still the largest market, but this time Italy gets quite close and the UK comes third. The ranking by models doesn’t change a lot: the Renault Captur continues to reign even if for second time in a row, it lost the pole position in France. Renault-Nissan controls 35,5% of the segment (in January the alliance’s share was 41,4%). The Fiat 500X posted the second best month since its launch but total sales decreased 16% when compared to the month before. It was 1 unit behind the Skoda Yeti and ahead of the Jeep Renegade with 5.645 units. However the 500X is still very far from its direct rivals as the Renault Captur, Peugeot 2008 and Opel Mokka sold more than 13.000 units each. The Fiat was partly helped by the Italian registrations, which counted for 45% of the total, but that’s where the problem is. Italian demand isn’t contributing enough to the success of the new 500 family member and the car can’t even enter the top 10 best-selling cars in the country. In May it was outsold by the Opel Mokka, while the Nissan Qashqai was crowned as the best-selling SUV. But low demand isn’t just a matter of Italy. The 500X isn’t shining in other important markets such as Germany, Spain and the Netherlands. In contrast, France, Switzerland and Belgium have welcomed the Fiat small SUV. 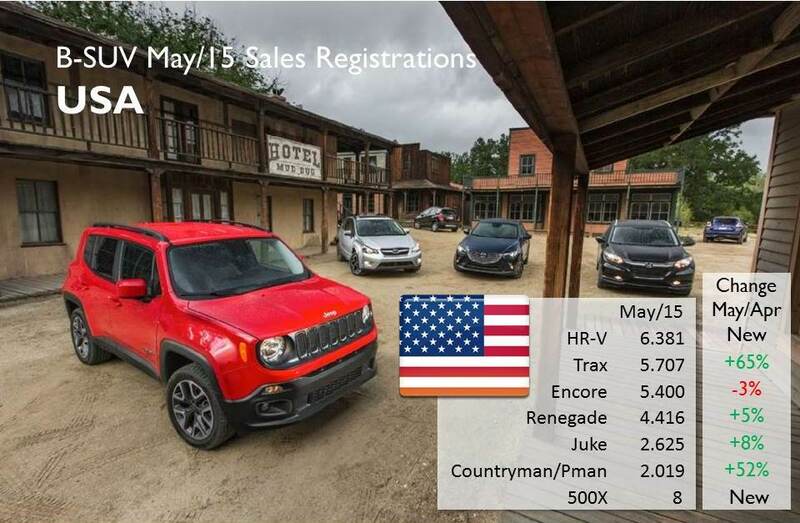 The other B-SUV from FCA, the Jeep Renegade, was able to increase its registrations when compared to those of April but still below the March’s record. 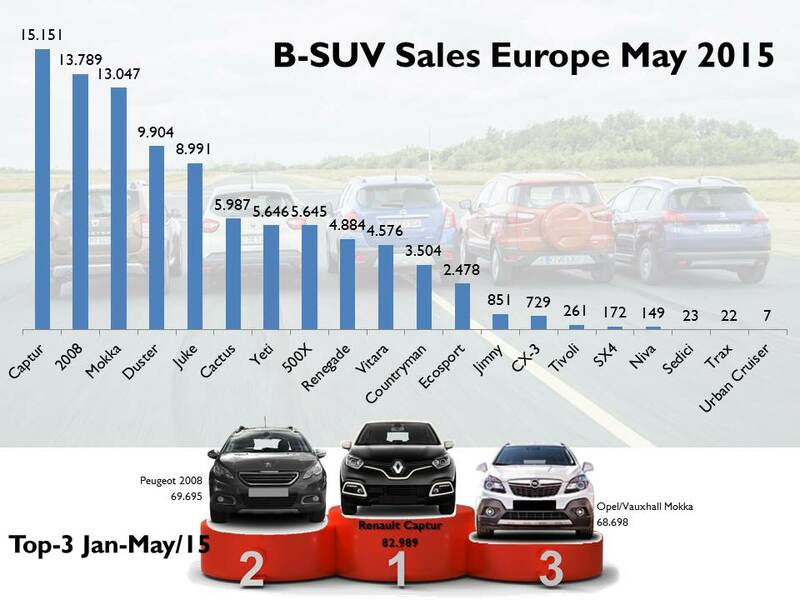 A total of 4.884 units were sold in Europe in May 2015, counting for 5,10% of total B-SUV sales. This is the first time the Renegade’s share passes the 5%, which is not bad considering its price and positioning. In fact the baby Jeep outpaced its direct rival, the Mini Countryman while sales in Europe were higher than those registered in USA (4.416). 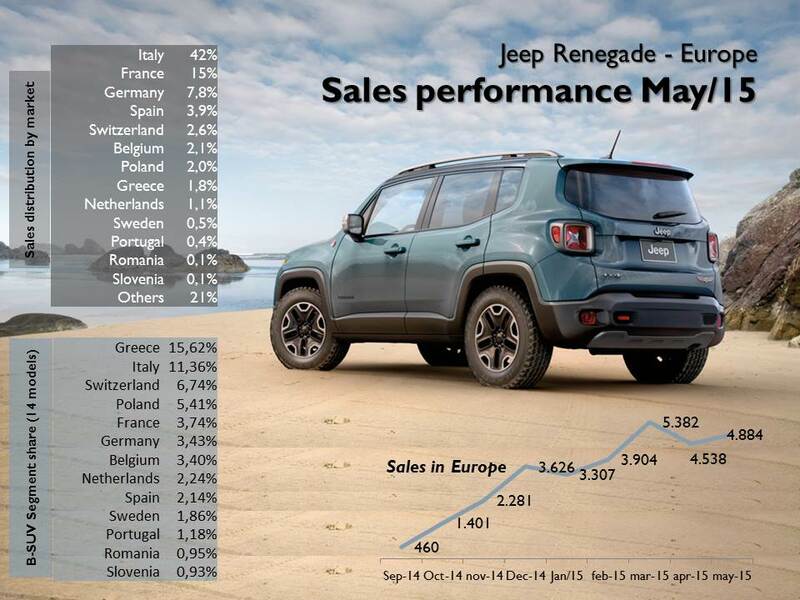 In terms of segment share, the Renegade had a good performance in Italy (11% share), Switzerland and Greece (where it became the country’s second best-selling B-SUV). Once again, if these results keep taking place in Europe and USA, FCA will be able to meet its annual production levels for the Renegade in Melfi plant (around 130.000 units). Melfi is also the plant that produces the Renegade for USA and Canadian markets (Mexico will introduce it in December 2015). In May, the baby Jeep posted mixed results in North America as in USA it was able to keep growing while Canada’s numbers are still marginal. 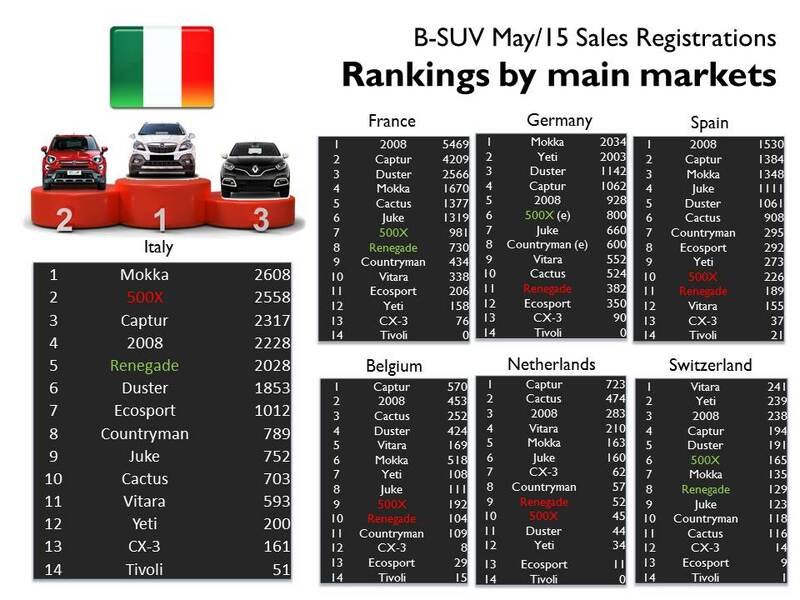 Still, the Jeep lost 2 positions in the ranking compared to April. The Honda HR-V and the Chevrolet Trax had impressive results during May leaving the Buick Encore and the Renegade at third and fourth places. Playing as a “local” and Jeep branded, the Renegade could do much more against the Honda and the GM products. Only 60 units were sold in Canada, down 67% on April’s data. 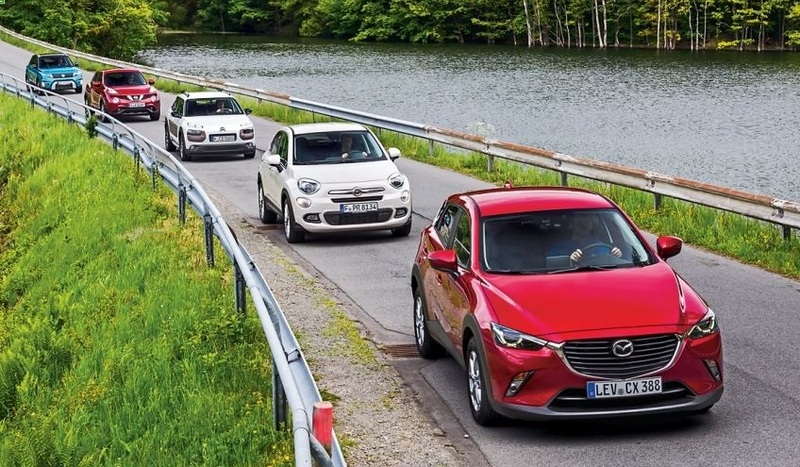 The Chevrolet Trax takes the lead but the Mazda CX-3 had a brilliant start positioning at second place and outselling the Nissan Juke and the Buick Encore. 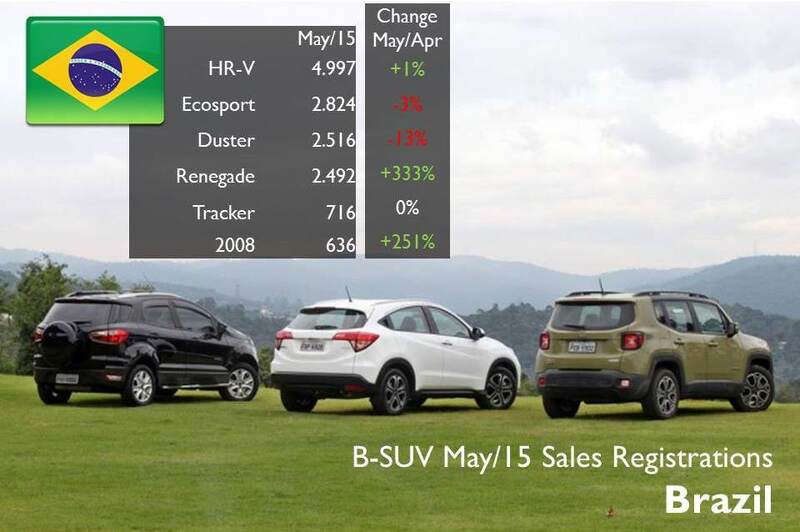 In Brazil the Renegade finally took off with almost 2.500 units, up 333% month-on-month. The locally made Jeep had a negative effect on the sales of the usual leaders, the Ford Ecosport and Renault Duster but it was still behind them at fourth place. As it happened in USA, the Honda HR-V impresses in the pole position with more than 5.000 units and becoming the country’s best-selling SUV. Brazilian new car sales took another harsh beating in May, down 26%. ← B-SUV: why VW doesn’t join the party? Thanks for this useful note on the 500X(+Renegade)! FCA’s PR press release on their better-than-average-for-the-market growth in Europe in June says 7500+ 500X-s were sold in June, which is up really smartly over the May figure. Also, 500X supplies in RHD to the UK: have they hit full-availability? Even 500X supplies to the US market are nowhere near full-tilt, apparently? It does appear that they’ll easily enough meet the overall volume targets for the Melfi plant. No? But imo IF the 500X is not in the top-5 consistently in the b-suv segment in both the US and in Europe+UK…..they must ditch any idea of the next-up Fiat-branded C-Suv (twinned to the Jeep Compass-replacement) being part of the 500 sub-brand line-up: badge and style it as say the new ‘Freemont’, perhaps, instead? I don’t think there will be a twinned to the Jeep C-SUV branded Fiat. We will see. Thanks for the reply, Juan. No? I had assumed the Freemont would be replaced soon by a c-suv based perhaps off the Brazilian fcc4 concept pickup? In any case that’s a couple of years away if at all, i guess. Juan as you know there is a ‘New Avventura’ scheduled for India at the end of 2016, a b- or maybe c-suv (size wise, not price). Any idea what that is? And will there be such a second 500X sized Fiat-badged SUV/CUV for Europe and Turkey etc? There have been rumours of a Panda X, a bigger replacement for the Panda Cross, for a couple of years……?? A kind of Dacia Duster-fighter? Do you know that SATA plant in Italy can’t produce enough 500X-s/Renegades? Demand is much higher than supply. Punto is leaving SATA next year and it’s place will most likely get 500X/Renegade and possible C-CUV FIAT model. Thanks for the information. I haven’t got any news regarding that. Right now there is maximal theoretical capacity for 280k 500X/Renegades at SATA per year. Both EMEA and NAFTA are supplied from there. Last month they sold more than 10k in NAFTA region. We can expect that combined sales of 500X and Renegade can easily be over 20k for every month for combined EMEA and NAFTA markets. So obvious step is to take Punto’s portion of SATA plant and with that capacity will exceed 450k per year. That’s in accordance with FCA’s plan to produce only high margin cars in Italy. Obviously with 500X starting at almost 19k euros in Italy for 1.3 MultiJet II 95 HP in Pop trim it’s a high margin car. Only anomaly for plan with Italian plants producing high margin cars is Pomigliano with current generation Panda. Grugliasco got QP/Ghibli, Cassino is moving to Giorgio based products while in Mirafiori they are setting up production line for Levante and there are plans for yet another line in Mirafiori for Giorgio and future Alfa’s E-SUV. In Pernambuco has recently started pilot production for FIAT Toro and Jeep Compass, both SUSW based vehicles. And I’m wondering why didn’t you cover news for FCA’s NAFTA dealers show? They showed Alfa D-SUV but also next generation Dodge Charger and Dodge Barracuda both based on Giorgio with TT Pentastar with around 500 HP. There is a lot of reshuffling for North American FCA’s plants. Any sign of the 500X being released in Brazil ?